It has been shown that many proteins are functionally related to cancerogenesis. Reliable quantification of these proteins, so called biomarkers, in human serum or tissue biopsy samples represents a way to assess better diagnosis and improve patient outcome. Moreover, small molecule drugs inhibiting biological function of these proteins are also used in cancer therapy. 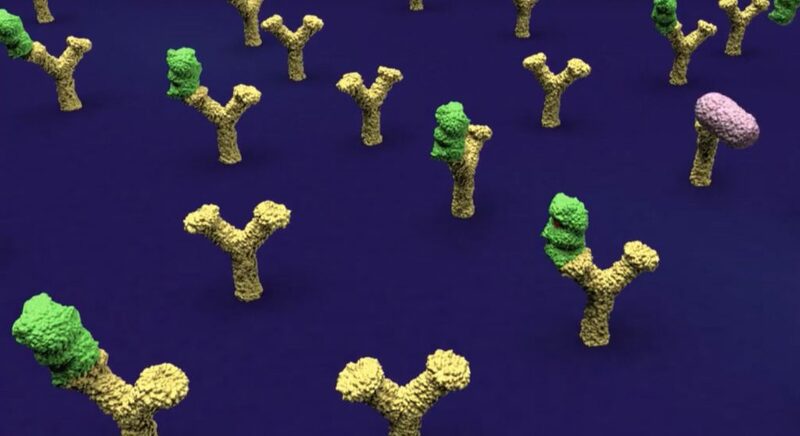 Here we present a newly developed assay, called DIANA, which is capable of both selective protein detection and screening of small molecule inhibitors of those proteins. DIANA is a multiwell-plate based sandwich ELISA-like dual recognition assay, suitable for protein detection and screening of protein ligands that employs a fully synthetic detection probe. This probe is constructed from small molecule active site ligand and it consequently binds into the active site of the target protein. As we have shown on two proteins, DIANA has proven to be an excellent method for protein detection which is characterized by superior sensitivity, broad linear range, and high selectivity. Additionally, it has two more unique advantages over most widely used sandwich immunoassays such as ELISA, immuno-PCR and proximity ligation/extension assay. Since the probe binds to the target at a defined site via small molecule ligand, the selectivity of binding of the probe can be always tested by titration with the free ligand. Moreover, in contrast to the sandwich immunoassays, this assay is not prone to false positive results due to interfering antibodies present in human blood and is, therefore, best suitable for use in in vitro diagnostics. We have developed an ultrasensitive and selective ELISA-like assay for detection of target proteins in biological matrices with linear range of up to six logs. Moreover, the assay is suitable for accurate, quantitative and sensitive high-throughput screening of small molecule ligands on unpurified target proteins, most notably of competitive inhibitors of enzymes. Currently, we look for business partner who might be interested in collaborative commercial exploitation of the assay. The assay was developed to detect two relevant cancer associated proteins: Prostate Specific Membrane Antigen (PSMA) and carbonic anhydrase IX (CAIX). We were able to detect zeptomolar amounts of both enzymes, which translated into sensitivity of 1 pg/ml or lower in blood serum by analyzing 10 µl samples. We also showed the ability to quantitatively test competitive inhibitors of both enzymes, which was possible even when using untreated human serum as a source of the enzymes. DNA-linked Inhibitor Antibody Assay (DIANA) for sensitive and selective enzyme detection and inhibitor screening. Navrátil V, Schimer J, Tykvart J, Knedlík T, Vik V, Majer P, Konvalinka J, Šácha P.
Nucleic Acids Res. 2016 Sep 26. full-text version of the article can be found here.